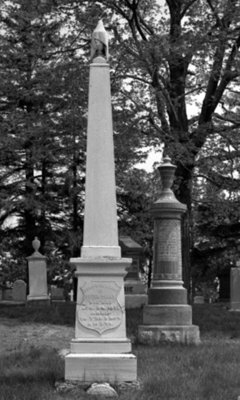 A black and white photograph of Peter Perry's gravestone in Union Cemetery, Oshawa, Ontario. Peter Perry was born on November 14, 1792 at Ernestown, Lennox and Addington County, Upper Canada. He lived in what is now known as Whitby from 1836 to 1851. He was a member of parliament for the Reform party from 1824 to 1836 and from 1849 to 1851. He was responsible for developing Whitby Harbour and the road from the harbour to Georgian Bay and started the proceedings to form Ontario County. He established the village of Perry's Corners at Brock Street and Dundas Street in 1836 and the village of Port Perry in the late 1840s. He died at Saratoga Springs, New York on August 24, 1851. He is buried at Union Cemetery, Oshawa. SACRED TO THE MEMORY/ OF/ PETER PERRY/ WHO DIED/ AUG. 24, 1851./ AGED/ 58 Y'RS 9 MO'S/ & 10 D'YS. Peter Perry Gravestone, Date Unknown, Brian Winter. Whitby Archives A2013_004_456B.